There are many plans out there that offers iPhone 4 at a subsidised price but choosing the best plan that suits my needs wasn’t at all difficult. I like iDiGi 88 Plan from Digi because it is the cheapest and most affordable plan that offers an iPhone 4. With the iDigi 88 Plan, I get a subsidized iPhone 4 with Unlimited Internet Access, Free TalkTime, SMS and also MMS. This fully unlocked the potential of the iPhone 4. I also do not have to worry about the apps in the iPhone auto-updating and auto-syncing using my connection and gives me a shock when my bill comes in. 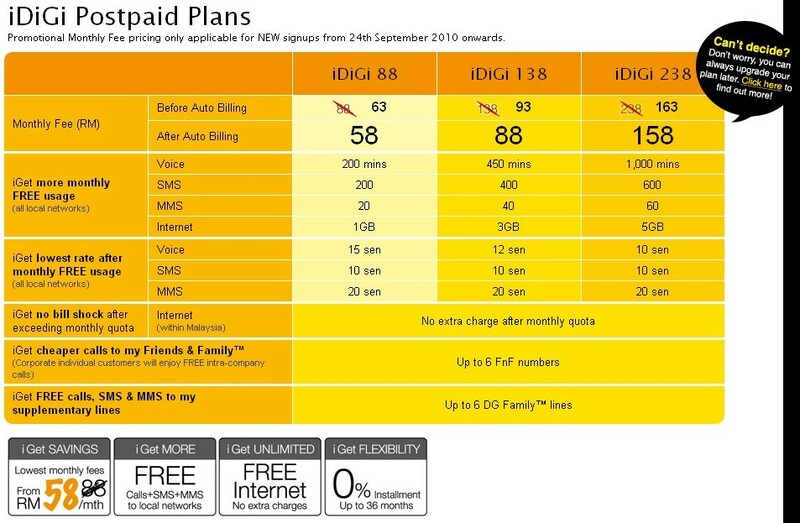 If you’re wondering why it’s called iDigi 88 Plan since it only costs RM 58 per month, here’s why: It’s original price is RM 88!!! DiGi is soooo generous that they are willing to charge us just RM 58 per month (that’s a saving of RM 30 per month, RM 360 per year!) if we choose auto billing.